The sport of winter swimming in Nanning originated in the early 1930s. On January 21, 1934 the Jingwu Sports Club held its first winter swimming competition in Yongjiang River with 30 swimmers. Since the liberation, this sport has been growing. On January 7, 1958, Mao Zedong twice enjoyed a good winter swim in the Yongjiang River. By this activity, Chairman Mao created a great upsurge of in interest in this sport in Nanning. 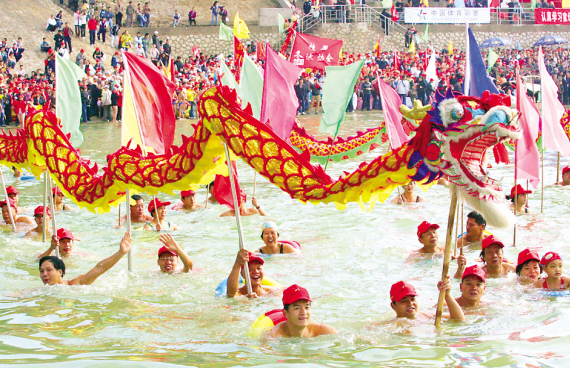 From then on, winter swimming in Yongjiang River has become a traditional sport in Nanning. Before 1979 the winter swimming competition was organized by the municipal government. Since then has been conducted by the Winter Swimming Club of Nanning This sport has become quite popular nowadays.